Summertime is a great time to add some color to your Fort Worth garden. You can get outside, enjoy the weather, the sunshine, and add character and style to your front or back yard. 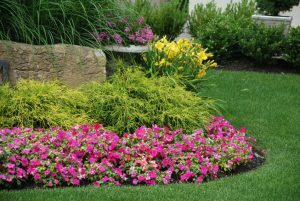 Blooms Landcare has gathered the top flowers to plant this season to liven up your landscaping. Asters are bright and cheery perennials that thrive and bloom nearly all summer-long. They are available at most local nurseries and come in 1-gallon cans. They come in a large variety of colors such as lavender, pink, or white. A lovely twist on the traditional daisy, this flower has a deep golden hue on its pedals that radiate from a warm chocolate center. They can reach up to 4 feet tall; so only place them where you need the height. There are shorter varieties available such as the “Goldilocks” and “Toto” that grow to a maximum of 10 inches. These are large blooming flowers that radiate a bright yellow. They are a defining summer flower as they are bright, cheery, and light. They have double and semi-double flowers that bloom all summer on little water! They are perfect during a dry season. These are some vibrant blooms that grow from tuberous roots. They come in a large range of colors such as red, yellow, and cactus-flowered variety. They do require some light shade but otherwise thrive in the hot summer season. These daisy-like flowers are incredibly charming with their rosy hue and orange centers. They stand a bit tall at four feet but make for a great summer blooming flower. If you would like more tips on how to maintain your garden this summer, call Blooms Landcare at (817) 688-5352 today!